Note – I’m not going to get in a discussion here about the morality of the medieval Christian church. What I mean to convey is the idea that while Jews, Christians and Muslims believe that God created the universe and has some measure of control over nature (i.e. he can control the weather and such), they put their focus on his code of rules (thou shall not kill, etc.). Clerics of God, therefore, should be defined by their alignment. Almost as soon as the game was written, though, it started to change. Clerics stopped being tied to an implicit Medieval Christianity and instead were tied to polytheistic deities, most of them just anthropomorphized forces of nature. Rather than the pseudo-Templars and Hospitalers that seem to have been intended under the original rules, we got clerics of Thor and Loki. Since Thor was Chaotic Good (if my memory of the Deities & Demigods/Legends & Lore book), his clerics needed to be Chaotic Good as well, which meant they needed to be “crusaders” for enlightened freedom. The Thor of mythology, however, did not seem particularly concerned with moral concepts. He was a personification of thunder and lightning, and, if anything, a ready and eager foe of the giants (i.e. natural calamities). It should have made more sense to use druids as the priests of all the nature deities, but they became saddled with the concept of True Neutrality. Ultimately, several unrelated systems were mashed together to make something that was mostly fun, but also didn’t make much sense. Clerics, like magic-users, are spellcasters. The universe they inhabit has physical laws that can be broken with magic spells. In other words, the supernatural in thus universe is natural – it’s just a nature with processes that are beyond most mortals. The universe also has gods, goddesses and other divine beings. Maybe they created the universe, maybe they just have a secret knowledge of how it works. Either way, clerics join their cults and learn how to perform rituals that can alter the fabric of reality in ways the gods and goddesses are willing to allow. Magic-users are the hackers of the universe. They alter the fabric of reality without anyone’s permission, and it’s not easy. They have to learn the code of the gods and hijack it. This forces them to spend all their time figuring out how to get things done, and gives them little time left over for learning to fight. It also allows them a much wider array of powers than the clerics (though they still haven’t figured out how to hack into the healing spells). Clerics in this scheme are not champions of an alignment, but champions of their cult/church/temple/brotherhood/etc. They represent their little faction in the very dangerous fantasy worlds in which they live, just as fighters serve kings and thieves serve their guilds. The name of the game is survival and power. In this scheme we do not need to tie the god of thunder to a particular alignment. He has a cult of followers whose existence allows him to play games in the cosmos (think of the scene in Jason and the Argonauts with the gods moving mortals around like chess pieces) or who just brag about how awesome he is. In return for their service he lets them alter reality on his terms. Within this cult, there can be clerics of any alignment, so long as they advance his agenda. In fact, the god of thunder might not even pay much attention to the cult. Maybe he gave his “passwords” to somebody long ago, and they passed the knowledge down to those who would serve them loyally. Clerics of Thor can be lawful, neutral or chaotic. The lawful clerics like to stick up for the little guy, the neutrals serve their order loyally to stay in good with their masters, and the chaotics try to get away with as much as possible without being expelled. This would endow these invented religious organizations a bit more color and intrigue. The lawfuls and chaotics within the cult don’t quite trust each other, and each works to control the cult because they fear the other faction, but they aren’t necessarily at each others throats all the time. The lawful heads of the cult might even understand that the chaotic clerics have their value in the organization, doing things they might shy away from, but which are necessary to advance the cult’s goals in the world. A deity that does represent or espouse a moral or immoral concept might, of course, restrict his or her clerics to a particular alignment. A deity of charity would want his clerics to be charitable – this would make chaotic clerics a bit tricky. Likewise, a god of trickery would want his clerics to be tricky – this might not work well for lawful sorts. 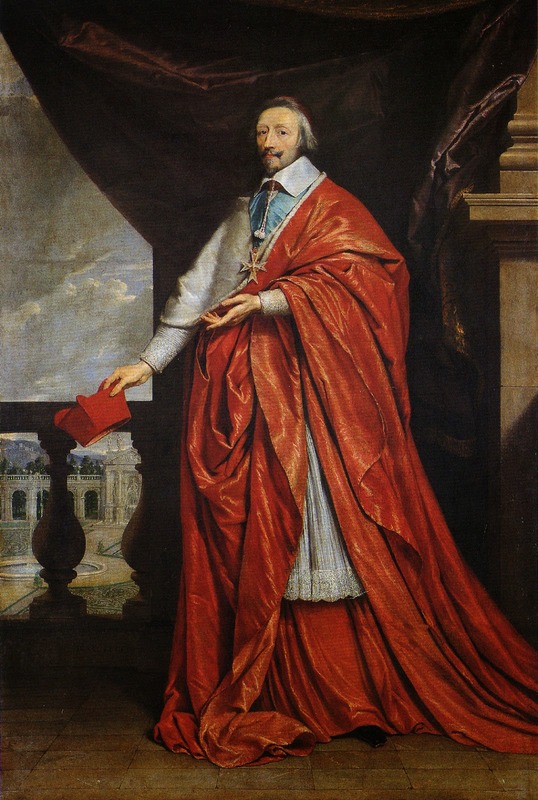 Then again, consider Cardinal Richelieu – a member in good-standing of an ostensibly lawful church, and a terrible villain if most accounts are to be believed. I guess this is a conception of alignment and clerics that would only fit in well in a Robert E Howard-style fantasy world, where the name of the game is power. It certainly wouldn’t be to every player’s taste, but it should please some players or at least prove entertaining for a while to veteran players. At a minimum, it could free clerics in the game from being forced into the role of do-gooder or do-badder, and instead make them more enjoyable to play. I understand where you are coming from, but I am not sure I agree with your approach. The problem lies with our own real world views as much as with the game and is why “fixing” the game “problem” will always cause contention. While trying to set personal opinions aside, I still come back to a “single god” creator, even for a fantasy game. A multi-god universe does not make sense, although, I can accept a universe with extremely powerful beings (who may call themselves 'gods'), and that may appear to act like gods, and behave in a way you describe. However, there can be only one true creator to make sense of an alignment system, which basically states you are either for or against what this “one true god” purposes. This is a really difficult topic to handle and one I am always at odds with within my own campaign. Not because I don't have what I feel is a workable system along the lines I describe above, but because I do not feel it easy to apply alignment shifts due to what that shift is trying to say to the player. That said, I go with what I have and hope my concept of “good” and “evil” is as best determined as I can do (based on my own values) and hope the player will agree. As an example from my own campaign, as far as “clerics” are concerned, while it is true that they may follow one of many “gods” that may have different alignments, the truth is that these “clerics” may not actually be aware of the one true creator, except from the values they receive from the “god beings” they follow who in turn, may or may not follow the ways of the one true god. In other words, alignments may differ, but only according to the purposes of the one true god who is all powerful and uses everything to their own end, which I have to assume is for the perfection of good. By definition, anything that opposes this would be considered evil. I could go on, but it would take to long. 😉 Hopefully, I have given the gist of it … basically, alignment of clerics reflects the overall persuasion of their position to the creator, which is generally headed by a demi-god like character. Sorry, that should have read “too long” and not “to long”. The gods, saints/transcended mortals and other spirit beings function within a vast, bickering bureaucracy. Differing gods and pantheons function like political parties and special interest groups. Most of these entities are too immersed in their own rhetoric to notice the needs of mortals. Clerics are lower-level politicians and lobbyists, looking to sway political powers within this “Council of The Gods”, either in the court itself or in back-room deals. Lawful Gods cannot openly take part in unlawful acts (lest they be defamed by enemies and former allies), and so they leave the messy sorts of actions to Clerics and other allies. And once again, I prove that the old Dragon Magazine Forums from 20 years were no aberration. I love the amount of thought people put into these things – but then gamers are often thoughtful people. For me, I try to focus not on the invented cosmology, but rather on generating adventures for the players. Putting an evil high priest in charge of a “Lawful Good” religion (Cardinal Richelieu for example) seems a great way to cause no end of trouble for adventurers. Much would depend upon Cardinal Richelieu's (CR) own understanding of his faith and the faith he believes he is representing. For instance, the actual faith (“lawful good”) represented by the faith (which we have to assume to be correct according to its holy book or writings) cannot be anything different from what it says it is. i.e. It is a true reflection of itself and the true God/creator that wrote/provided it. However, CR (or other “evil” followers of said faith) may not be following said faith accurately due to their own alignment as governed by the demi-god/demon that controls them. (This opens up the whole freewill v pre-destination argument of course.) In other words, using a real-world analogy, saying one is a “Christian” does not necessarily make them a Christian: “You shall know them by their works”. So, if CR professes to be of one faith, but his actions clearly demonstrate different values to what the faith requires, then CR is either deluded (if unaware) or an infiltrator of the enemy (if conscious of the fact). And by “works” we actually mean “belief”, so you would recognise a follower of a faith by what they “believe”. So, it is even possible to believe in one thing and do something else, which would make them a hypocrite of course. However, (and this is where it gets difficult due to real world recognitions of what good-evil is), we must also recognise that “sin” causes rebellion against “truth”, but that if one's belief is true (even if poorly executed), then said CR *is* still “lawful good” – but NOT according to sinful actions, but by what he believes. Note well, however, if CR continues actions contradictory to what the faith says and does not repent of them, then that would suggest an unbelief of the truth, which would mean they are truly “evil” and that their is no hope for them. This, as I said before, is a difficult topic to cover when considering what is involved with matters reflecting “good” and “evil” … Mainly because one can see certain acts of a person, which tends to suggest their alignment, but does not reflect their heart (or true state), which only the true God would know, being their Creator. For gaming purposes, it is probably best to just assume a PC's actions represent their “heart” and therefore faith … and to keep it simple, the “bad guys” are always following an “evil” god/demon and the “good guys” are always following a “good god”, with an exception that some may be working undercover perhaps. However, to try to wrestle with alignments on any other shades than that would involve studying the various world wide religions we have today with respect to why we are here and why there are such concepts as good and evil. That is what happened to me, and why I became a Christian! i.e. The concept of good and evil can only exist when we have been told what “good” is. In other words, one can only speak of good and evil if they work from a frame reference, which in our world, is of course, things like the bible. If we had not been told the difference between right and wrong, then D&D would never have included alignments. However, we have been taught such and so it has crept into the game and is why it (like the religion from which it came) causes such difficulties for people. A quick addendum …. All you would be doing with what you propose is to actually remove the cleric class (and what they actually represent) altogether, even if you keep the class name to represent something else. The problem with that is that it removes a reflection or line to the true Creator altogether and would water down the purpose of conflict in a game. If you read Ecclesiastes of the bible, your system would reach the same recognition as that, BUT without the conclusion that the book of Ecclesiastes reaches: That everything is meaningless without God. Now, I agree that we must be *very careful* when dealing with alignments, and your solution would probably work for many players, but would, like anything that entertains elements of right and wrong, limit what alignment actually does mean. i.e. A better approach would be to avoid alignment altogether and make no references to “gods” at all … unless well justified and explained … but to do so you come up against the same problems as we discuss above. I think there are two solutions: Make something up just for fun, but recognise it will lose its impact to the point of being somewhat twee (perhaps not to all players) … or take a serious look at it and try to implement a system that reflects a better character class role for the cleric. This, I believe, was the original (albeit possibly misguided) intention of the class, when “Christian values” were perhaps better understood even than they are today. The problem today, is that it seems to me (I could be wrong) that people do not understand or are not as interested in knowing/learning about a real world faith, so the same problems translate into any game system that otherwise does try to incorporate one with any more depth than what was supplied with the original D&D game. Bottom line: To define what a cleric is and what they represent, and if one wants to develop a cosmology that is worth including for game purposes, then more work is involved. However, if one just wants to make a class that does *NOT* actually represent a connection between their god and faith, then the class needs to be removed altogether and it should be replaced with something like, “FOLLOWER”. i.e. If you change what a cleric represents, then you change the cleric. You have to chuck the baby out with the bathwater. I think this is a great idea. This is similar to what I've believed for a while, which is alignment makes less sense as an ethical outlook, but as a faction allegiance. In a wilderness where hardy men defend wooden forts from ogres and goblins, the question is, “Are you aligned with the law of King Osric, or monstrous chaos?” In urban intrigue, “Republican” or “Loyalist” seem like appropriate alignments. So I can totally see having a factional alignment of “Thor”, but people of all manner of ethical outlooks could participate. You might find a sect somewhere's that's run by a self-aggrandizing, selfish and aggressive abbot (who behaves chaotic evil, essentially), presiding over a cohort of meek monks paralyzed by his domineering leadership (most of whom are neutral good, lawful neutral, and so on). As I say, one could replace “alignment” with “factions”, but you also need to drop the cleric class for what it was meant to represent at the same time. The problem is, people do not really understand what a cleric (man of God) actually is … due to not understanding the same (or having a misunderstanding) of what a cleric should be representing either due to lack of knowledge themselves … or being misled by the one claiming to be a “cleric”. The term “false prophets” comes to mind. This is the same concept as 'Eberron' has been using since its inception, isn't it? That Alignment is more a matter of individual ethos than a matter of 'faction' – thus it's possible to a Cleric of a Lawful god even if your Alignment is Chaotic. That's my understanding anyway. My Clerics are crusaders (except at First Level, when they haven't actually been granted any spells, just a vision of cosmic awesomeness that they're seeking to explain – if they decide that it's been sent by Loki or Ishtar or Hotoru, that's their business, but until they reach that first stage of enlightenment, I insist that they're called 'Seekers' rather than 'Clerics'). What it is they're crusading for is the aims of the cult they've joined. Thor goes out and fights giants. A devout Cleric of Thor goes and fights giants too. The Cleric tries to carry out the will of her or his God(dess). Alignment I regard as a general cultural thing. Dwarves – generally Lawful. But individual Dwarves can be Chaotic. Law and Chaos I'd regard as a relationship to society, but Good and Evil as a relationship to individuals. Lawful Evil is supporting a repressive state or social order; Chaotic Good is 'robbing from the rich and giving to the poor'.